It was a beautiful spring day for this wedding in Indiana. 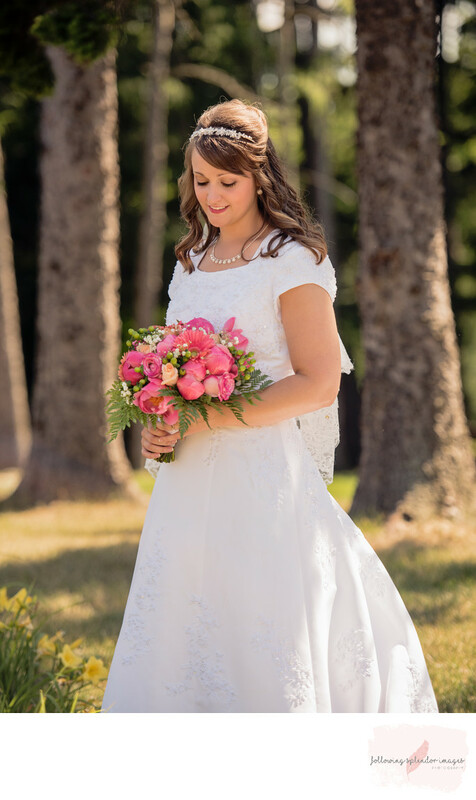 The bride carried a beautiful pink bouquet made by a close family friend. Her hair was simple and perfect with a crystal headband. She smiled so easily. She had simple jewelry that complemented every detail of her dress. The sun hit her perfectly in this image. All of her emotions were very real. I had all of the bridesmaids attend to other duties so we could just capture her real expressions. She needed a chance to breath before the rest of the day started to unfold. I love having a chance to work with my brides in a very calm un-rushed way before the ceremony. I usually plan on arriving 2-3 hours before the ceremony to capture all of the details of the wedding day and special portraits of the bride all alone. For this image, I just took her to a location where I could see the light was beautiful and allowed her to just fall into a natural pose and look with her bouquet. Make-up, hair and all dressed, she could now focus on what lie ahead of her this day. A first kiss with the one she loves. Location: Fairhaven Baptist Church, Chesterton, Indiana.